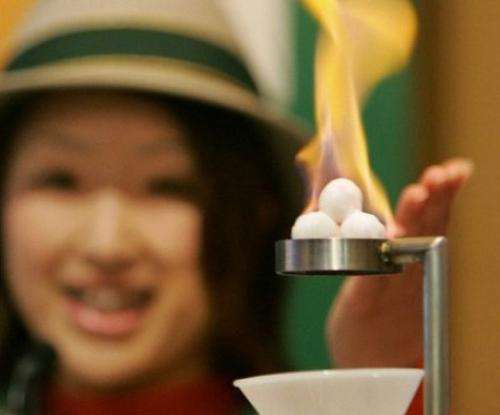 Attendant of Japan's Gas Pavilion introduces an experiment of the "burning ice," methane hydrate, as a potential future source of energy in Nagakute, Aichi prefecture, on March 19, 2005. A research vessel carrying German and Taiwanese scientists set sail for waters off the island's southwestern coast on Sunday in search of this potentially vast new energy source. A research vessel carrying German and Taiwanese scientists set sail for waters off the island's southwestern coast on Sunday in search of methane hydrate, a potentially vast new energy source. The substance, a fossil fuel that consists of very densely-packed methane trapped in ice, is found beneath the seafloor on continental shelves and in the Arctic's permafrost. Earlier this month, Japan announced it had successfully extracted the hydrate, known as "fire ice", from its seabed, a move it called a world first and a major breakthrough for the energy-starved nation. The 4700-tonne German ship, called the "Sonne" will undertake a 50-day expedition at a cost of around $3.98 million, three-quarters of which will be funded by Germany and the remainder by Taiwan. "This will be the first time we may be able to physically explore for the substance," Wayne Wang of Taiwan's National Science Council told AFP. Past studies have indicated reserves in the area could supply the island for up to 50 years. Nuclear energy currently accounts for around 20 percent of the island's energy mix but has become increasingly controversial in recent years following Japan's atomic crisis. Taiwan is heavily dependent on costly oil imports mainly from the Middle East and Africa. Hydrocarbons are the fuel of the NOW and near term (50 years). Drill here, drill now. "The polar bears will be fine." - Freeman Dyson. We gotta' live with it - sure as hell can't live without it. Apparently neither one of these two idiots even knows what methane hydrate is! I just don't see mining methane hydrates being a cost effective endeavor. For pressure drop pumping the fuel to water ratio is very low. And environmental liability is very high. If a region of the sea floor is destabilized and a massive landslide causes a large tsunami, there could be a lot of damage and death and not just in the country doing the extraction. Fossil fuels for fossil fools. It's exactly so. In 1931 year the energy in one barrel of oil was sufficient for mining of another 147 barrels of oil. In 1970 it was only 17 barrels and now it's just about five to seven barrels. It means that 20% of oil is consumed for mining and transport before the customer could even buy it. In this way the oil fields are depleted even faster then it could be estimated from production of crude oil. The end of oil era could come very fast, after then. Not if we use nuclear or renewable energy to power the well pumps. And to answer the obvious retort, "sure, whenever there's a practical battery, we will all be happy to trade in the internal combustion engine."